Close to downtown and right on the water (not the open ocean), it really feeels like a vacation. Facilities are pretty good and rooms are huge, but staff is a bit rude and not very customer oriented. I would recommend this hotel to a friend though...the location and facilities outweigh the poor staff. Great central location. Easy access to downtown and La Jolla. Staff is not terribly friendly or professional. The Hotel is very nice. However Parking of $15 per day is ridiculous. Should be given the chance to opt out! and refuse the hotel. An additional charge for parking is totally ridiculous...Highway robbery. Never again will I stay at a Hilton! Parking of $15 per day is ridiculous. Should be given the chance to opt out! With a prime location right on San Diego's beautiful Mission Bay, the San Diego Hilton invites its guests to enjoy all of the good things that life has to offer. Here, you can spoil yourself with luxurious spa treatments, improve your tennis game, or learn to scuba dive. The hotel's central location places it near the San Diego Zoo and Sea World. Got kids? The San Diego Hilton Kids Kamp features swimming lessons, face painting and more. Got employees? The meeting facilities are perfect for your business. This hotel has something for everyone! A Mediterranean Village awaits you at the Hilton San Diego Resort. Each room has a private balcony, where you can enjoy spectacular views of Mission Bay. Choose between a king sized bed or two queen beds. All rooms have Internet access, so that you can email your friends and make them jealous. 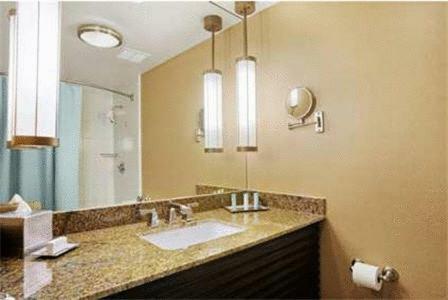 The Hilton San Diego Resort has a fully equipped business center. Yet since all work and no play will make Jack a dull boy and Jane a dull girl, you will definitely want to take advantage of the other amenities that the Hilton San Diego Resort has to offer. There is a fitness center, a putting green, a jogging track, jet skiing and scuba diving. These are just a few of the activities featured at the Hilton San Diego Resort. Its excellent location, as well as its top quality amenities makes the Hilton San Diego Resort a popular San Diego lodging venue. Guests raved about the hotel's kid friendly atmosphere, as well as its variety of activities for every member of the family. Its close proximity to the San Diego Airport eliminates the "when are we gonna be there?" syndrome!